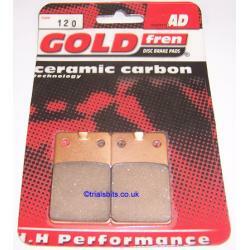 A set of brake pads which will fit the Montesa Cota 304 Front and the 307 Front and Rear. Will fit Fantic 201 301 front, 241 front, 243 front and rear, 303 front and rear and the 345 front and rear. Will fit most Merlin trials models, and the following Beta models which are all front only. Alp 51 TR32, TR33, TR34, TR35, 260 Zero, Alp 240/260 and the Synt.